The Best Minerals blogs from thousands of top Minerals blogs in our index using search and social metrics. Data will be refreshed once a week. London, UK About Blog Industrial Minerals is the market leading resource for in-depth non-metallic minerals intelligence. Providing insight and analysis on Industrial Minerals since 1967, Industrial Minerals is dedicated to serving the entire market; those who work in any part of the supply chain from mine to market. Facebook fans n/a. Twitter followers 4,082. Facebook fans 2,312. Twitter followers 440. Mountain View, CA About Blog Comprehensive up-to-date coverage for minerals, aggregated from news sources all over the world by Google News. Facebook fans n/a. Twitter followers 212,875. San Francisco, CA About Blog A subreddit dedicated to minerals. Facebook fans 1,089,046. Twitter followers 472,437. About Blog Mindat.org has been running since October 2000 with the aim of building and sharing information about minerals, their properties and where they are found.It is now the world's largest public database of mineral information with an army of worldwide volunteers adding and verifying new information daily. Facebook fans 94. Twitter followers 1,015. Dar es Salaam, Tanzania About Blog The mission is to set policies, strategies and laws for sustainability of energy and Minerals resources to enhance growth and development of the economy. Canada About Blog MGX Minerals is a diversified mining & minerals company developing novel and sustainable methods of Lithium, Magnesium and Silicon extraction. Vancouver BC About Blog Pure Energy Minerals is an emerging leader in the development of innovative, resource efficient mineral exploration and project development. The objective is to demonstrate and deploy low-cost and earth-friendly processing technologies to produce advanced lithium battery materials to meet the anticipated burgeoning growth in lithium demand. Facebook fans n/a. Twitter followers 2,173. About Blog Conflict Minerals Law is written by the Squire Sanders Conflict Mineral's team and provides legal insights & analysis on Conflict Minerals Law. Facebook fans 2,018. Twitter followers 8,723. Vancouver About Blog Orex Minerals Inc. is a Canadian-based junior mineral exploration company with an impressive portfolio of large gold, silver, and copper exploration projects on renowned mineral trends in Mexico (Coneto and Sandra Escobar Projects), and Canada (Jumping Josephine Gold Project). Cape Town, South Africa About Blog Cape Minerals is a gemstone and mineral trading concern to facilitate the trade and distribution of both specimens and knowledge from deposits primarily within Southern Africa to mineral collectors worldwide. Facebook fans 289. Twitter followers 1. Vancouver, British Columbia About Blog Mountain Boy MInerals Ltd. is a mineral exploration company listed on the TSX Venture Exchange under the symbol "MTB". The Company goal is to develop mineral resources on other properties through efficient exploration and strategic acquisitions. About Blog Nature's Rainbows is a non-commercial Fluorescent Mineral SuperSite maintained entirely by volunteer hobbyists and contributors. The mission is to provide information about UV and luminescence, premium fluorescent mineral photos, and a fluorescent mineral database for the enjoyment of FL mineral collectors around the world. Vancouver, British Columbia About Blog Arena Minerals Inc. is a Canadian based prospect generator with a portfolio of properties in Chile's premier copper and gold mining districts. KKT About Blog VV Mineral is a leading private mining company in India. VV mineral ensures that all their heavy mineral mining activities are eco-friendly. They constantly check their efforts to restore the areas of mining. Facebook fans 55,912. Twitter followers 37. Falmouth, Cornwall, UK About Blog An archival social and technological history of 21st Century mineral processing. Barry Wills of MEI presents news and views on mineral processing. Facebook fans 50. Twitter followers 100. About Blog Follow the blog to know more about Natural Mineral Makeup & Mineral Skincare. Facebook fans 1,390. Twitter followers n/a. 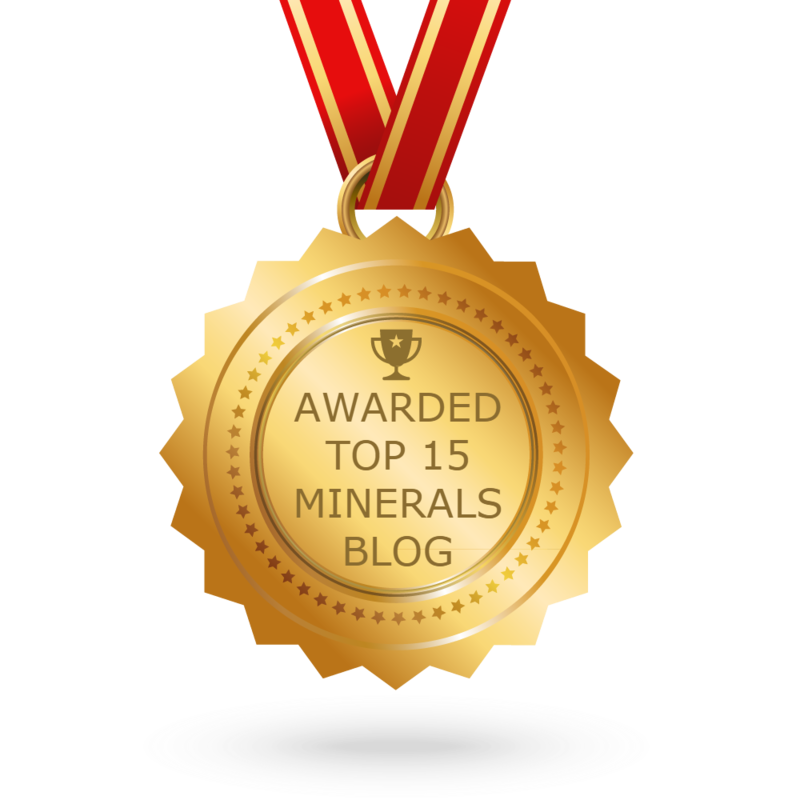 CONGRATULATIONS to every blogger that has made this Top Minerals Blogs list! This is the most comprehensive list of best Minerals blogs on the internet and I’m honoured to have you as part of this! I personally give you a high-five and want to thank you for your contribution to this world.